Turbocharge your Scrum Teams with Kanban! Scrum teams who use Kanban to improve their delivery often call their modified and improved process, Scrumban, Scrum+Kanban or just Kanban. It entails the application of Kanban principles such as visualization, limiting WIP and other Kanban principles to improve throughput and reduce lead time for delivery. SwiftKanban supports Scrum processes with an integrated set of Scrum features and metrics – to help you gradually improve your processes. In addition, SwiftKanban provides support to Iterative and other methods of Software Development, DevOps Management, Visual Project Management and Business Service Delivery. 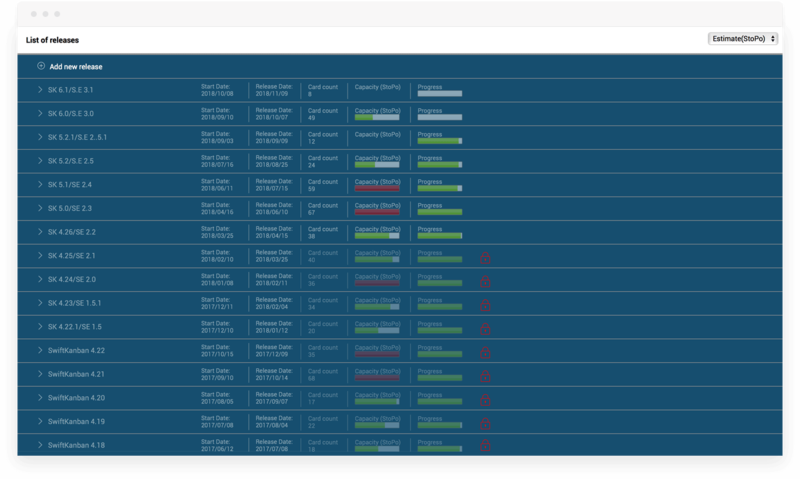 SwiftKanban provides a wide range of features, Agile Metrics and tool integrations to ensure full support for Agile. The Release and Iteration Planning features in SwiftKanban enable teams to make their Release Plan and then visually define the scope of each release in an easy-to-use drag-drop interface. They can also track the release progress using various visual indicators and charts available in the same view. SwiftKanban’s flexible Card Hierarchy feature helps define the typical scope breakdown that Agile managers use such as Theme – Epic – User Story breakdown. The feature allows complete flexibility in defining the hierarchy, the card-types and the levels of hierarchy needed to match your business terminology. 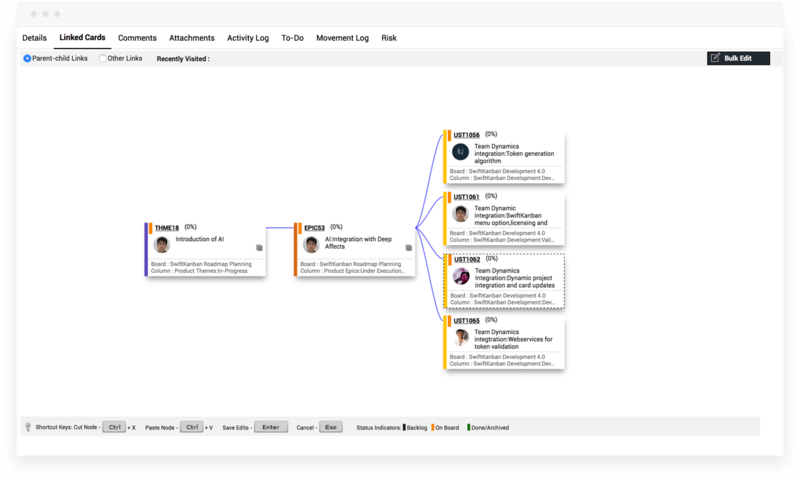 Defining the card relationships is available through a visual interface that enables the creation of child stories as well as linking existing stories to parent user stories. You can simply select a card and link it to a parent or multiple child cards. 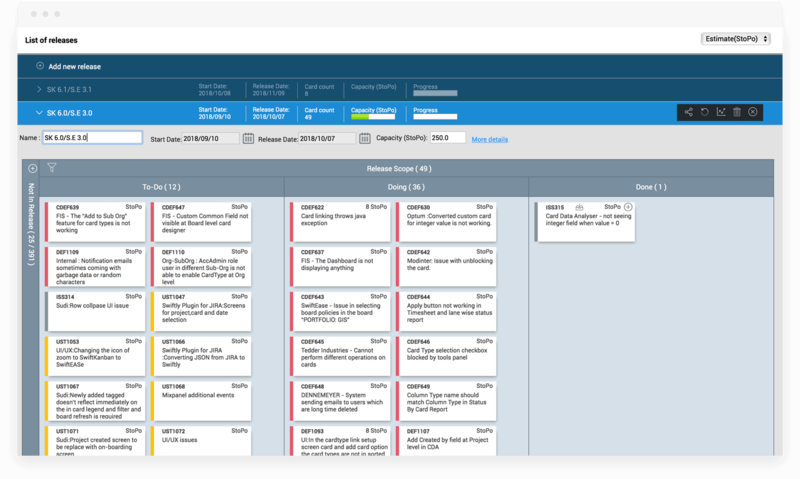 This way, SwiftKanban helps you easily setup your product/ application backlog and then plan your releases/ sprints. Of course, you can decompose a card into child cards at any point of time. 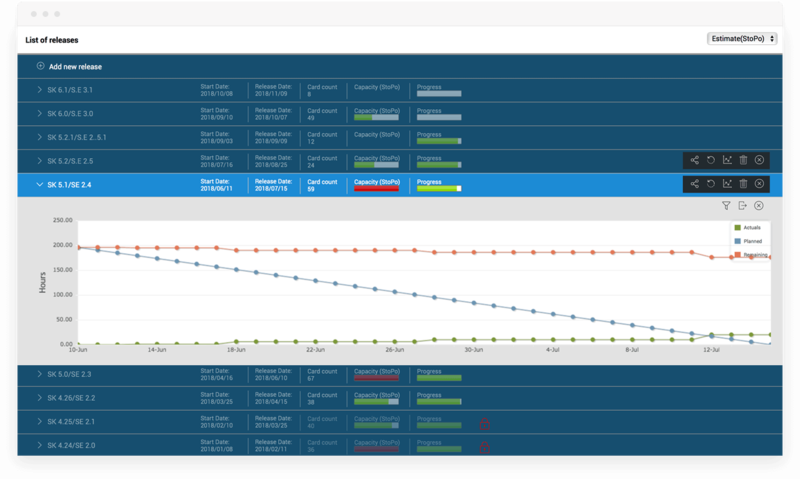 SwiftKanban provides Burn-Down and Burn-Up charts to enable Scrum teams to track the release progress exactly way they are used to. 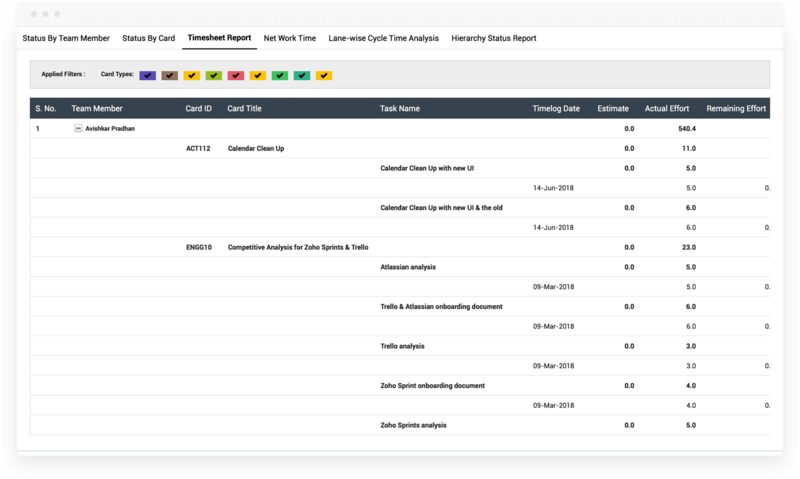 Team members can track the hours remaining to complete their work in a sprint and the actual hours already spent. 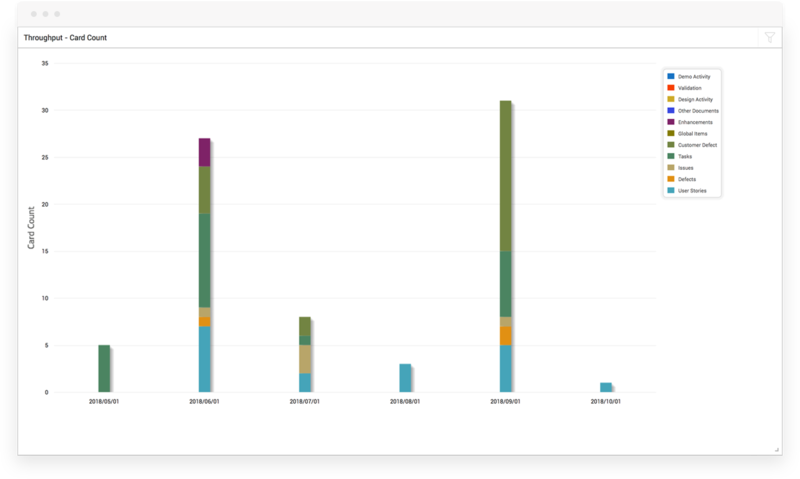 SwiftKanban provides a Throughput chart in terms of the amount of work completed in a given time period or other cadences such as Releases/ Sprints. The work completed is plotted by number of cards or Card estimates in hours or story points (Velocity). It also enables further analysis by the Type of work, Class of Service, Card Priority or Card Size. SwiftKanban’s Time-Tracking plug-in allows you to enter Actual/ Remaining hours against the card To-dos. These are used in the Burndown/ Burn-up charts, as also available in a Timesheet Report for further analysis or accounting purposes.